I first heard Peekamoose Blue Hole was in trouble last year. I’d recommended the spot to a buddy of mine, and upon his return he called me with a tragic tale. Things were grim: hundreds of people with grills playing loud music surrounded by broken glass and garbage. He told me there were so many cars parked along the road that it was difficult to drive past it. Peekamoose Blue Hole, as I knew it, was not supposed to be that way. While it hasn’t exactly been a secret since the dawn of the internet age, it’s location, lack of services, and deep, ice cold water temperature had always limited crowds. I was concerned, but held out hope that he’d exaggerated. When I visited last summer, it wasn’t anything like what my friend had described. There were more people then I’d seen before, even at noon on a Thursday, but it wasn’t alarming to me. When I planned a recent three day car-camping trip to the Sundown/Peekamoose, I was happy to go mid-week. Before I left, I checked swimmingholes.org. I found references to the recent abuses the area had suffered and emergency restrictions put in place. 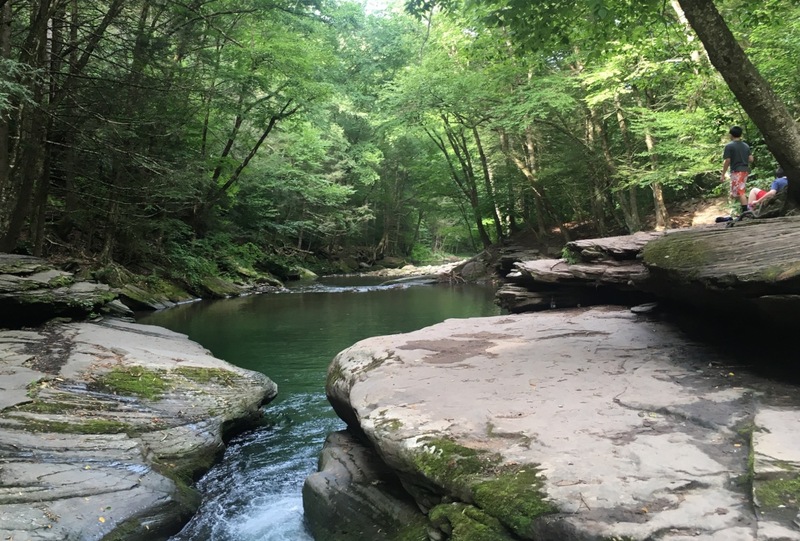 A google search of “Peekamoose Blue Hole” revealed articles about how internet exposure, extolling the swimming hole’s qualities, was drawing hundreds of people on summer weekends. This spring the state banned parking along the road, prohibited music and glass containers, and installed porta-johns and a dumpster. There were heart-breaking pictures of food trash, broken bottles and discarded diapers. We drove up on a Tuesday morning and pulled into the Sundown Wild Forest trailer field by noon. 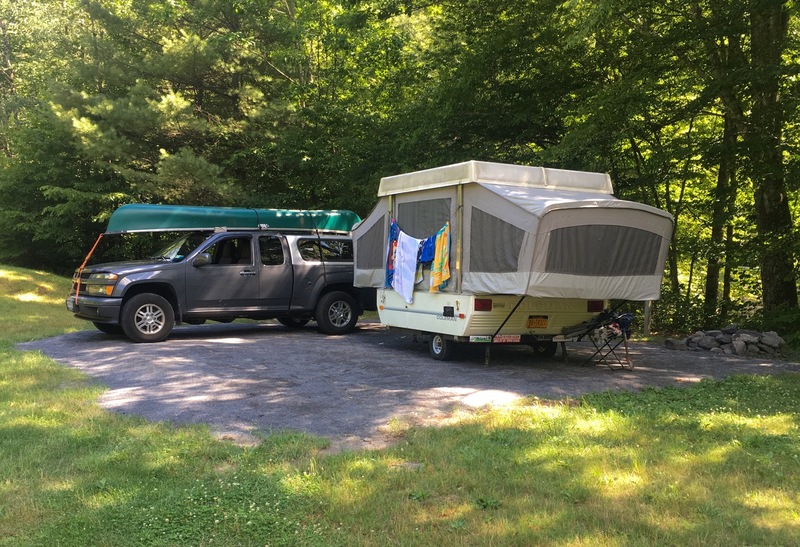 My kids waded in Rondout Creek, while I set up camp and made lunch. It’s an idyllic spot. With steep, wooded slopes on both sides, there’s a sense of isolation that’s hard to find so close to NYC. After lunch we walked up the road towards the Blue Hole. I spotted a Forest Ranger and asked him if things had gotten any better since the state had put restrictions in place. He was beside himself, saying they were getting seven or eight hundred people a day on weekends, far more then the area could handle. People were using it for birthday parties and family reunions and just as a spot to drink and get high. They were writing tickets and doing everything they could to educate people, but it wasn’t working. “This is the biggest crisis we’re dealing with in Ulster County right now,” the ranger said emphatically, “there are only four of us and we’re not getting the help we need.” My heart went out to him. He clearly cared for the place and was at the end of his rope. When we got down to the swimming hole, there were maybe thirty or forty people, some from NYC and others possibly more local. The ranger said it wasn’t that bad today. He nodded to a group of guys on the other side of the Rondout, drinking beer and said that was the kind of thing that worried him. My son and I threaded our way between the other groups to jump off the big rocks a few times. The water was as ice cold as I remembered. If you stay in more then a minute, you start to feel numb but the cold, refreshing shock of hitting the water is what makes it fun. It was the biggest crowd I’d ever seen there and it was Tuesday afternoon. I’m sorry to report that there was garbage everywhere, beer bottles, food containers, wet socks and liquor bottles. Trying to help in small measure, we filled a shopping bag with trash and brought it to the dumpster. In spite of all this, we had fun. It was still Peekamoose Blue Hole. As we walked back to our campsite, several people asked for directions to the swimming hole. I tried to put it all out of mind as I prepared dinner and my kids fought over the hammock. After that I had a couple of beers and we made s’mores. As the sun went down I sat by the fire as my kids played in the camper. Once it was completely dark, I called them back outside to look at the stars. The mountains here block out virtually all light pollution and it was a clear night. The stars were absolutely spectacular in that way that city dwellers never see. Wednesday morning we got an early start up Peekamoose Mountain. It’s bigger and steeper then my boys are used to so I didn’t pressure them to go all the way up. I figured we would turn around after three hours no matter where we were. In the end, short legs and all the distracting boulders along the way, prevented us from reaching the peak. We made it most of the way and had a great time. Thursday morning was our last day. We got up and hit the Blue Hole early and it was empty. We jumped off the big rocks. We waded and I actually swam around a bit. Having the place to ourselves was a luxury, as much fun as the first time I discovered the place. 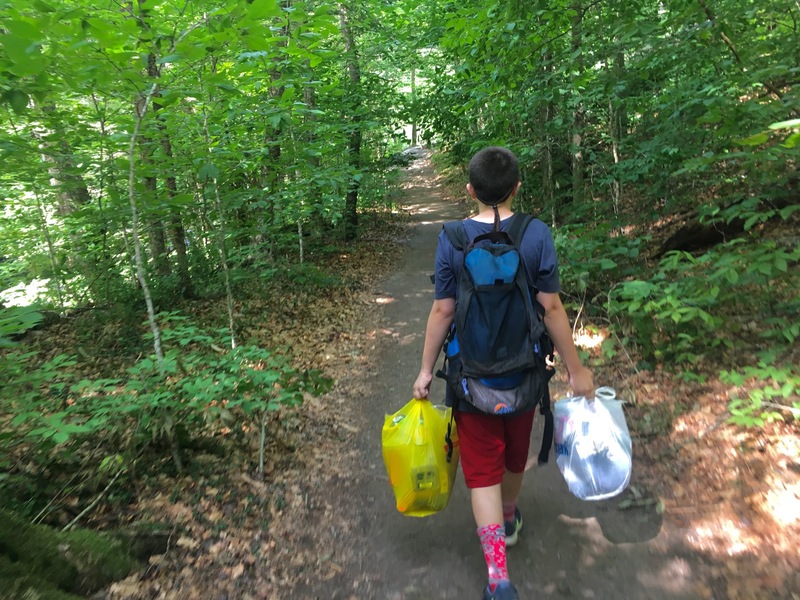 We hauled out some more trash as we left, including a bunch of empties, an empty Patron bottle, more clothes and about a thousand juice box straw wrappers. I’m worried about what’s happening at Peekamoose Blue Hole. I don’t know the answer any more then the outnumbered rangers. I don’t claim to have any moral authority to decide who can go there and who can’t. 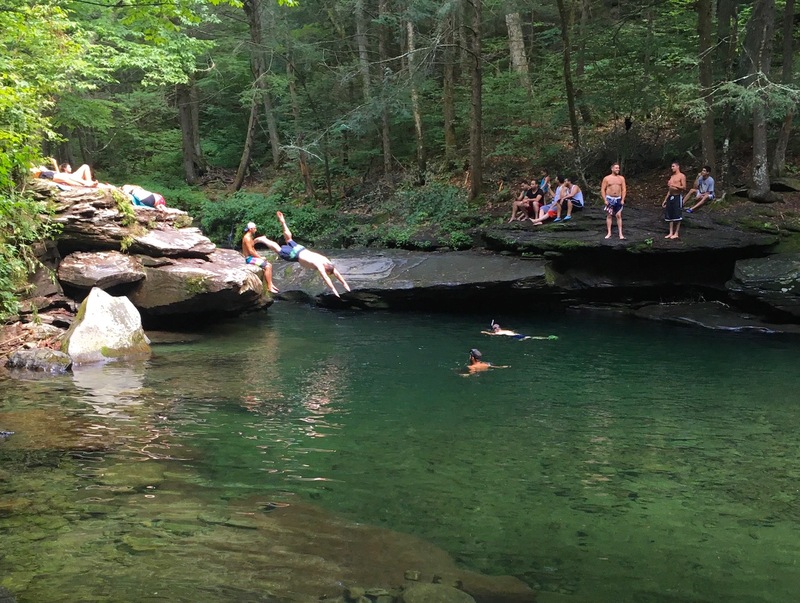 I’ve been visiting the Catskills for fifteen years but I learned about the Blue Hole on the internet too. Who am I to tell anybody not to go? In spite of all that, I think any sane person can agree that what’s going on now is awful and very wrong. The environmental abuse that is happening there is an anachronism, reminiscent of the 1970s TV commercial with the tear running down the cheek of the Native American standing on the side of a trash strewn interstate. 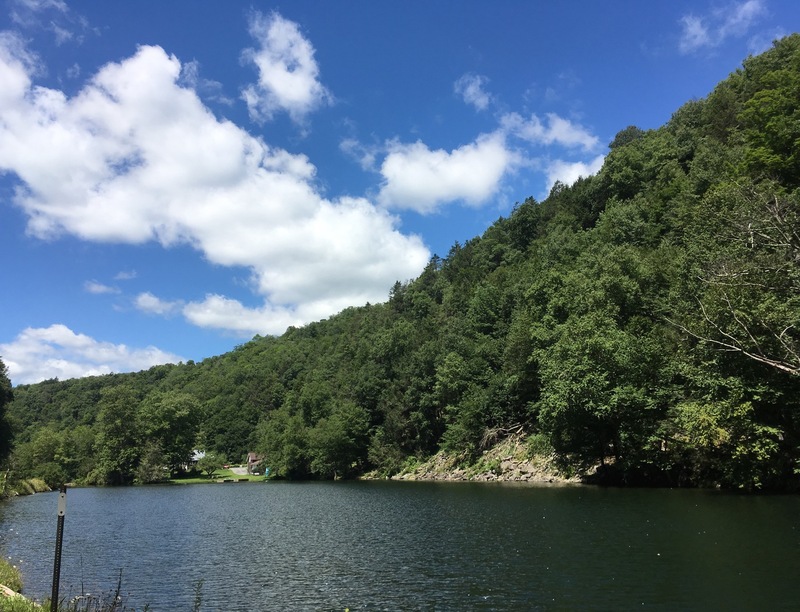 Peekamoose Blue hole is part of Rondout Creek, which empties into Rondout reservoir. Whatever gets thrown in eventually ends up coming out of an NYC water faucet. I’m generally in favor of leaving wild places unmanaged but, at Blue Hole it’s not working. Unless some authority steps in and gets control, the place is doomed. I hope that the next time I go back — really early on a week day — Peekamoose Blue Hole isn’t surrounded by a big fence. Tough to take sides. I think that the more people that we can get into nature, the better chance we have to preserve nature. The problem is that the more people that we can get into nature, the more assholes we get in nature, destroying the nature we love. Half the problem would be solved if people simply cleaned up after themselves. As we learned in Girl Scouts – leave it on better condition than you found it. Since when is it OK for people to just drop their trash where they are standing? I’d love to get to the Blue Hole someday. The basic truth is: the more people that use nature, the worst nature is treated. just look at wherever there are more people, there is more destruction, more trash more graffiti. Yet we want people to see and use nature, so HOPEFULLY they will appreciate it, but the truth is NOT that. If there are more people, there will be more trash. Of course as Jennifer naively says, “if people simply cleaned up after themselves” REALLY? come on now, that is correct, but it won’t happen. The sad truth is more people equal more destruction. I don’t have an answer for the problem, but I know what my eyes see as truth, I don’t have to be told what is happening IF i see it with my own eyes. Every neighborhood (almost) has been sliding down closer to the trash bin. My town in a nice neighborhood of north jersey is NOT the neighborhood I grew up in 60 years ago. I live in the same house, my kids went to the same school that my wife and I did) and it wasn’t as good as it was when we were kids. Now, its worse then 15 years ago. The streets are dirtier, there is more crime, and now English is not the only language that kids come to school speaking, and some don’t care to learn English (and don’t have to to graduate!). The streets are crowded, there is a ton of traffic, the teachers are besides themselves trying to teach kids that don’t care. The problem that Brownski has described, and did an EXCELLENT job doing, is happening all around us. Growth is not universally good. Increase population is making all of our lives more stressful. Brownski, you wrote another wonderful story, and please keep writing. But, this was NOT a surprise for me to hear, and I bet, deep inside your soul, it was NOT a surprise to you. Look at our general quality of life: its much more stressful then it used to be, and the many places that used to be so tranquil, quiet, spiritual and deserted, are now crowded, busy and dirtier then any other time. I go to a very beautiful state beach in new jersey every weekend to watch the sunrise over the ocean and when the season starts and people fill the park, i see tons of garbage and disrespect for the beauty that nature gives us. Twenty years ago I did not see this, now i see it every weekend. This weekend (at 5:30 AM) i saw a large group of Hispanic speaking people, walking in a well marked and fenced off area, clearly marked “no trespassing.” They camped on the beach and went to defecate and urinate in the sand dunes. The toilets were about 200 yards away in the parking lot. They just didn’t care, yet we still believe that its best to let people use nature so we admit more people to our parks. It would be very hard for anyone reading this article to know a place or a town or a city where life is better, cleaner, less crime etc, then there was over the last several generations. I love the internet, i use it everyday to find places like the blue hole, but in reality, this is accelerating the destruction of these wonderful spots in nature BECAUSE more people find out and more people go to these spots. Thanks for the comments guys. It certainly seems like it’s a more difficult problem then it needs to be. One thing that makes it tougher which the ranger pointed out to me is that it seems to be a different 7-8 hundred people each week. It’s fueled, as has been pointed out, by Internet and social media attention (which maybe I’m making worse right here). I can attest that almost every time I’ve visited, somebody has stopped me on the road and asked where the swimming hole is. Last week, as I was hooking up my trailer to my truck, another couple wandered into th campground and asked if I knew where it was. The guy had a cigarette and a bottle of beer in his hands- at like 11 in the morning. 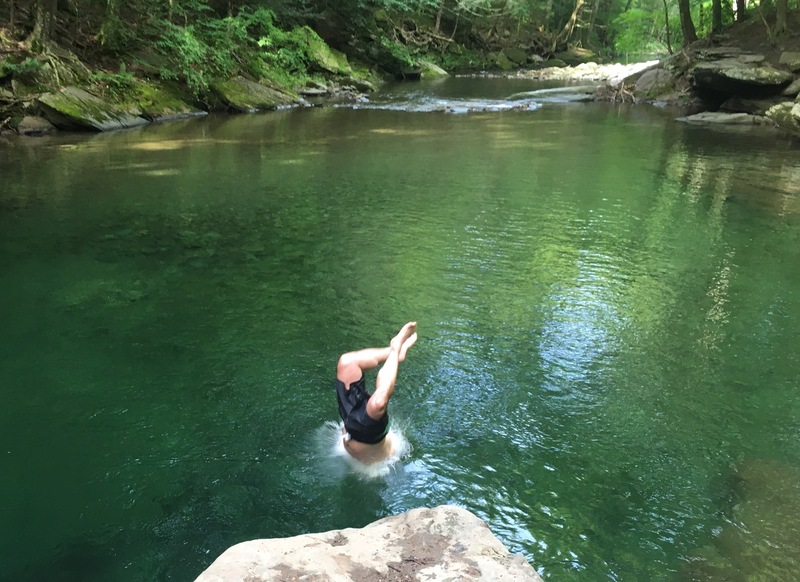 A great swimming hole is like a stash; if too many people know about it, it’s bound to be trashed. Thankfully, my favorite Catskill swimming spot is not as advertised as PBH, and offers numerous falls and pools to spread folks out. …and it’s f’ing beautiful. As someone who grew up a few miles from one of the northeast’s most thoroughly desecrated bodies of water (Onondaga Lake), thanks for the excellent piece/photos and for cleaning up after the zeroes who leave all their trash behind. Phew. Somebody above should think of moving out of Jersey. I did a long time ago. Trust me, you’ll be happier. Benny, you seem to be many things. Happy ain’t one of ’em. I’m not familiar with Peekamoose Blue Hole, but I would think that the overuse could be controlled by limiting access. Put in a small parking area that accomodates only the number of parties that the swimming hole can reasonably handle, and ticket anyone illegally parked along the road. Maybe even put the parking area a distance down the road – the further the hike the more riff-raff gets screened out. I’m generally not in favor of restricting access, but it seems well justified in this case. Those are good ideas. In fact, that’s what the state did this spring, in addition to banning glass and music, putting in a dumpster, portajohns and installing signage. They’ve been writing tickets like crazy but there are only four rangers covering that area and they’re not all on duty at the same time. At the least they need more support from other law enforcement, either more rangers from other areas, state troopers or maybe Ulster sheriffs dept. So, in other words, there’s a legit parking area for like a dozen cars, and then there’s another 50 or 60 cars illegally parked along the road? Wow. Sounds like the sheriff should come along and generate some revenue for the town. I’ve seen some examples in national parks where illegal parking has been aggressively discouraged by placing boulders, guardrails, etc. I wonder if that would help. The situation there sounds critical, I hope a solution is found. Thinking about having a family reunion there. Anyone know if they offer a shuttle from the parking lot? I dunno. You live in an overpopulated toilet. Adjacent to an overpopulated toilet (as is the Catskills) is going to be something not entirely unlike an overpopulated toilet. The Catskills are gross, the NYC area is gross, New Jersey is gross, Long Island is gross. Your story doesn’t surprise me. What surprises me is your surprise. Don’t want to live or recreate in a toilet? Leave the toilet. Would I like to roll out of bed every morning and gaze out upon the Adirondacks or Green Mountains instead of my little corner of suburbia? Sure. But to call the Catskills a toilet is unfair. 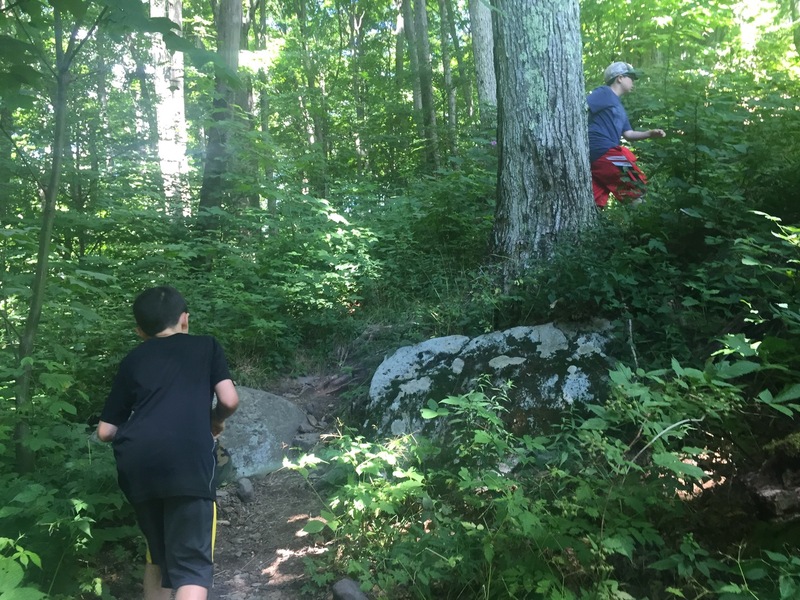 We hiked Peekamoose Mountain and didn’t find any garbage on the trail. We spend lots of time around the Cats and they are beautiful and obviously not toilet-ish in any way. There’s a group of people that are overusing this place for things it shouldn’t be used if for. That’s all. 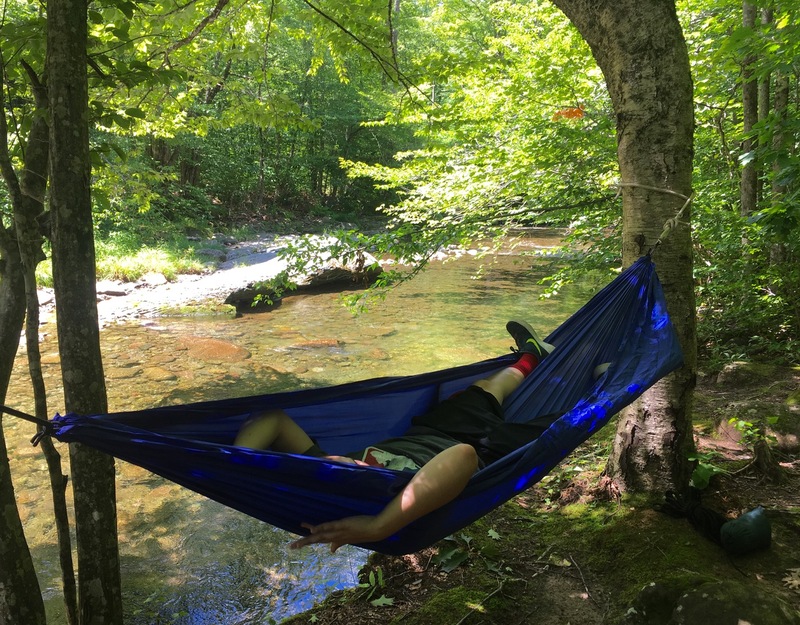 The blue hole is not a picnic ground and I want people to realize that and appreciate the place for what it is. You want to “gaze out upon” the Green “Mountains”? Those overused little pimples in Vermont? I loved the Blue Hole. I’m so glad you wrote about it. When I lived in NY back in the 80’s and 90’s we camped there all the time and cleaned up after those that left trash. We kind of designated ourselves as the Blue Hole Patrol. Back then they didn’t want people parking right there on the road and sometimes it was so bad it would be hard to get through. We always walked. There was 1 ranger and we got to know him. He was really cool.Is the rope swing still up? I think if I was to go I’d get there early and leave and go back to the camp site if it got over crowded. There were times back then it would get a little out of hand but nowhere like 7 to 8 hundred a week. The trash we used to say these people think its a garbage pit. It would make us mad but we brought large trash bags and when everyone left we’d just clean it up. =) Nothing’s changed except a lot more people now know about it. charge. there are other ways to take out the trash. I can do it So can you!!! I understand your anger. Carry-in /carry-out seems pretty simple to me. I was hoping to get back up there to this summer do an update but I had other things going on. Maybe you (or another local) could give us an update on how the Blue Hole weathered 2017. A permit is now required to visit The Hole, hope it’s helping. Junior and I visited again last weekend, after hiking nearby and the place was worlds better, though it was pretty late in the afternoon when we arrived so it might not have been the best test case. The online permit process was easy as can be. We brought a couple garbage bags but there wasn’t much to pick up this time. I camped in Peekamoose Valley (at the “Lower Field”) this past weekend. In the late morning, we drove up the valley, not in search of swimming, but just to look at the scenery. I’d heard of Peekamoose Blue Hole but didn’t know anything about this issue. We saw the swimming hole from the road, but when we tried to park there, we were met with a small army of park rangers, who told us, very professionally but not exactly kindly, that we couldn’t park there, and in fact we wouldn’t be able to access the Blue Hole even for a minute to look at it. They seemed stressed out. A local resident who later sold us firewood explained the problem to us, in terms of hundreds of Guatemalan gang members who would visit on Sundays, steal other campers beer and food, and generally abuse the area. I don’t fault the rangers for the strict enforcement – it seems like they’re doing a good job of doing what they need to do to protect a natural feature while still allowing people to use it for recreation. It’s just interesting to observe how this issue really seems to bring out people’s emotions, and it seems even their political assumptions.